Online Hazard Communication "Right To Know"
for just $49.95 per employee. You don't have to hassle with locating a "Safety Consultant" or waste time, and travel expense to do a simple, but misunderstood task that you can easily do yourself in less than 15 minutes. "At HazComOnline.net, we help contractors and small businesses that don't have the luxury of big training budgets certify their employees for just $49. 95/ per student -- the very same day"
You'll be able to manage the whole process right from your desk top with out all the headaches, and print ALL of the OSHA required proof when ever you want. HazComOnline get's you all the required proof of safety training and the crucial paper trail that OSHA and inspector's require. Train and certify your employees whenever and wherever you want-no more scheduling hassles, paying overtime, or pulling everybody in on a weekend for "Training Day". You already use the internet to bid jobs, cut costs and to communicate with your customers and employees...right? Not Sure If Online Training Is Right For You? Many companies prefer the control and convenience of training their employees in house. We have assembled the entire online course into a kit that enables any company to train and certify employees for Hazard Communications at a reasonable cost. The kit contains step by step guides for the trainer and the trainee. Including templates for certificates and the crucial documentation that OSHA demands. Your satisfaction is guaranteed. If the program is not right for you in any way, simply return it for a full refund, including shipping charges. We stand by our products! Follow step by step guides to keep your employees safe…and in compliance with OSHA regulations. Get the entire program loaded onto your own Flash Drive! No programs to download. No TV'S, projectors or classrooms are needed. Simply purchase the program, read the material, and certify your operators. And for a limited time we have loaded all the templates, curriculums, power points, basically the entire program on a 2 gig flash drive. Microsoft Word required. Print unlimited copies of the entire program. Hazard Communication employee "Right To Know" certification. The following were the top 10 most frequently cited standards for fiscal year 2009. 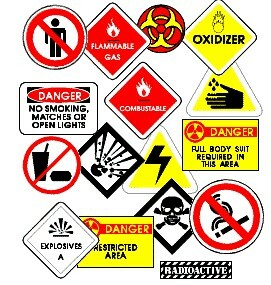 Hazard Communication Standard, general industry (29 CFR 1926.134). Online HazCom will help you meet OSHA's training requirement as required in the Hazard Communication Standard and teach your employees the essentials of working with hazardous chemicals. Hazard Communication is an OSHA standard that requires employers to create a program addressing chemical hazards in the workplace. Upon completion of this learning event, employees will demonstrate knowledge of Hazard Communication programs. Employees will learn about the hazards of potential chemical exposure, types of hazards, Material Safety Data Sheets, chemical detection methods and how chemical hazards are controlled. When you have completed your online training course, you will get your certificate of completion immediately, as well as your official HazCom card in the mail. The online training program is OSHA accepted, and is exactly the same as what you would receive with any on-site training. You don't have to live in fear of an OSHA Safety Audit. Get your employees trained properly and certified in Hazard Communication safety. A common myth is that small businesses are exempt from OSHA regulations. However, companies with less than ten employees must still comply with regulations and are subject to penalties for non-compliance. OSHA inspectors focus on whether the employer is providing a safe or sanitary workplace. OSHA training informs workers what OSHA defines as a safe workplace and what inspectors are looking for during compliance audits. One way to do this is by training employees how to conduct internal safety audits. If performed correctly, these safety audits will identify potential safety issues, which can then be corrected before the real OSHA inspection. The bottom line is that identifying potential issues saves companies money. Safety related expenses can include penalties and fines from OSHA, medical costs of injuries, lost work time due to injury, and long-term liability from injuries.